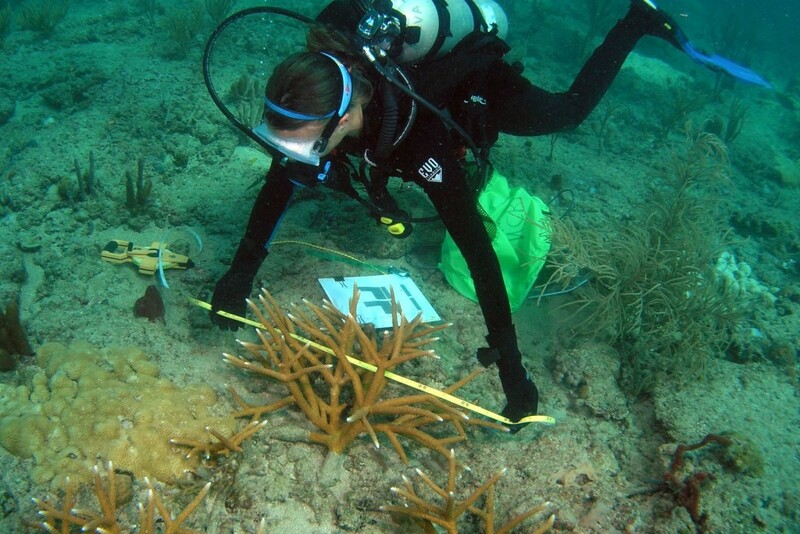 Tracking individual colonies should be done several times throughout the population enhancement process, from when coral fragments are collected, through the grow-out and propagation of corals in nurseries, and after corals have been outplanted back on reefs. Diligent labeling of corals in each of these phases allows practitioners to track individual genotypes and assess their success in nurseries and on reefs during various environmental conditions, and ensure that a diversity of genotypes are being transplanted on reefs. Tracking donor colonies after fragments have been taken provides information on whether fragmenting techniques caused any short-term negative effects on the wild population, such as increased tissue loss, disease, or mortality. 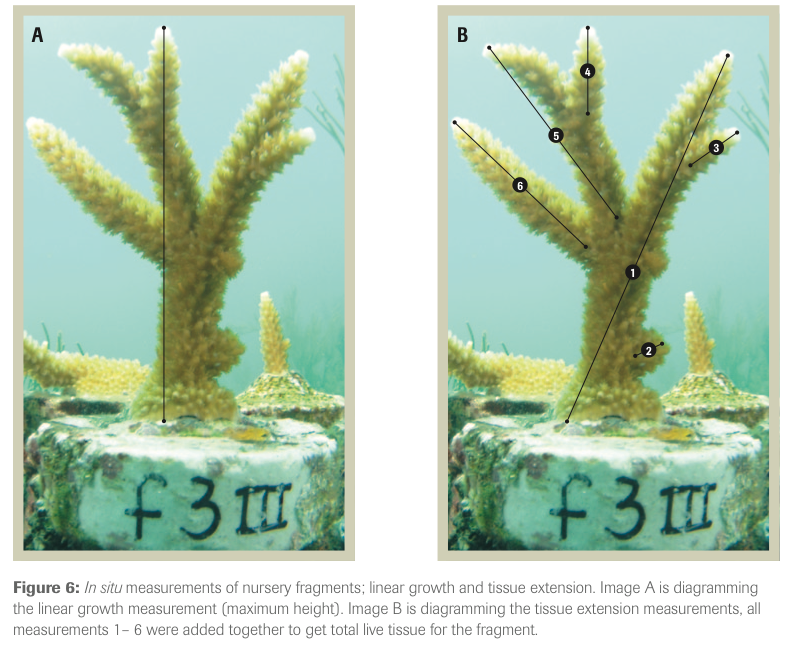 Removing up to 10% of an Acropora cervicornis donor colony has proven to be an effective amount that does not cause short-term harm to donors (<1 year). If nursery collections do cause increased mortality or disease in donor colonies, managers should assess the potential causes and try new methods. Monitoring can be done at various levels, from detailed colony-level data, such as colony growth, to quick overviews to evaluate nursery structure stability and overall general health and condition of the nursery colonies. Both types of data collection are valuable and will be determined by the goal(s) of your program. Detailed colony-level data is important to complete more frequently during the initial years following nursery establishment in order to evaluate the success of the nursery and to determine where improvements can be made. Schopmeyer et al. (2017) has proposed a benchmark of >80% survivorship of corals within nurseries. Once a nursery is well-established, data collection may be shifted to more observational data collection such as levels of predation or disease, and approximate size of the colonies in order to determine when pruning should occur and how much space will be needed for new colonies. During the culture of corals, it’s important to pay attention to coral genotypes that show resistance to stressors, such as temperature extremes or disease. These may be good candidates for outplanting in specific environmental conditions and may have genes that will help wild populations adapt to environmental stressors. However, it is important that less hardy genotypes continue to be cultured, as it is more important to be enhancing genetic diversity within local populations. Additional monitoring events may be needed surrounding pruning and expansion events. During each pruning event, it is important to keep track of the genotype from which new nursery corals are being propagated. 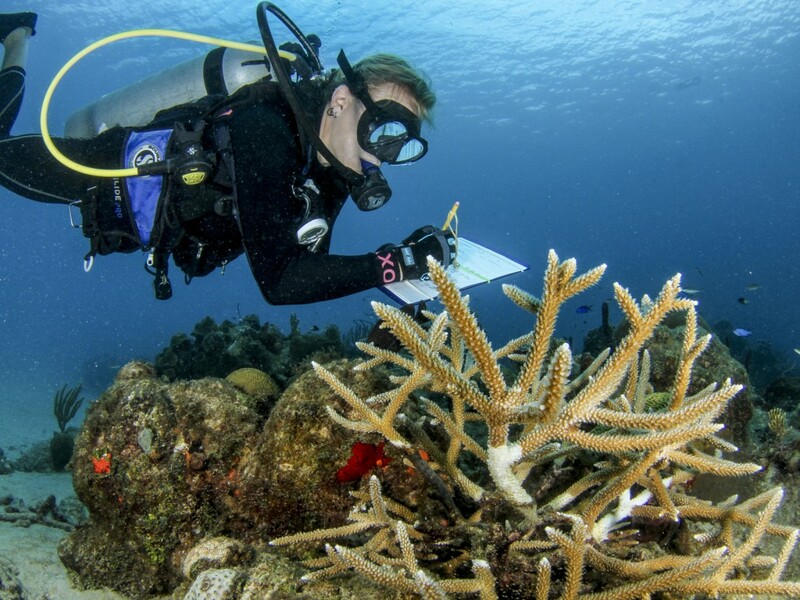 These data are imperative to nursery database management to keep track of how many corals and of which genotype are currently in the nursery stock. Collecting this data frequently aids in understanding differences in genotype productivity, nursery health, and outplant planning. During each monitoring event, time should be devoted to nursery structure evaluation and maintenance. These duties include checking the lines for fraying or areas of weakness, that coral trees are floating at an appropriate tension, reducing any overgrowth (of algae, fire coral, tunicates, barnacles, etc. ), stabilizing any loose fragments, removing coral predators, and trimming dead coral skeleton where possible. Opportunistic monitoring: If time allows, nurseries should be monitored before any major storm or disturbance event to ensure all structures are secure, and loose fragments are attached or stabilized. When conditions allow, these activities should also occur following a storm or event. The most common methods for monitoring outplanted corals is to track the success of individual colonies secured to the reef substrate. Regardless of your monitoring plans, outplants should be monitored within one month to reattach any corals that have become dislodged after outplanting or replant some corals if mortality occurs. After this, monitoring of outplant health or success often occurs at six- or twelve- month intervals after transplantation. Additional monitoring can also occur after or during certain events, such as large storms, major bleaching events, or for spawning.